I had intended to end up with three garments inspired by my native american research and that is what I have ended up with. I went back to the British Museum and drew more pictures of artifacts, this time more in depth looking at the shapes and textures of these objects. The last time I went my drawings were very sketchy and quick but over the time of the course I have learnt to give myself more time when it comes to drawing so they end up successful. 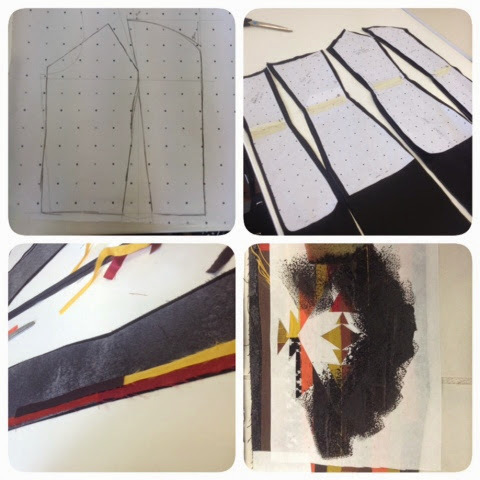 I wanted to create three garments with a range of textile techniques to embellish them and it is evident that I have done that in what I have produced. I am very pleased that within a few weeks I have created not just one but three successful garments. I faced some technical difficulty when creating the garments but I managed to work out the problems and get them fixed. Some of the dresses were changed slightly so I could end up with a better outcome. I am please with the small collection I have created, I think Its clear to see the inspiration behind the three pieces through the patterns and colours I used. The three dresses were simple in shape and decorative in embellishment and that choice was inspired from the fact that the native Americans would have simple garments but were decorated with beads or embroidery like my collection. I started off by designing my own pattern pieces, I really wanted a princess bodice style dress to make it fit nicer on the body. One of my dresses involved me cutting up strips of fabric and then attaching them onto the fabric using bondaweb, although this process took some time the ending result was beautiful. I love how because of it being handled, the strips of fabric would fray a bit giving it that rustic look which really added to the feel of the dress. One problem I faced when making this dress was the fabric pieces becoming stiff because of the layers of fabric which altered the shape of the dress. However it wasn't nothing a couldn't of darts couldn't fix. Another part of embellishing this dress was the printing which involved me cutting out several templates from freezer paper and then ironing them on and printing over them using fabric paint. Despite the time it look the colours of the strips worked well with the black native inspired printed design. Both techniques worked well together so for that reason I wouldn't change it. To give the dress that finished look rather than adding lining to stiffen it even more I added bias tape to the top and bottom of the dress. Overall I love how this dress turned out, there were times where I thought It wouldn't work but I'm glad that everything did eventually work. I had designed one of my dresses to be full length but I wasn't confident in making it without having my model there so test out the length so I changed it to be short at the front and long at the back so it wouldn't matter as such. Again I made my own pattern pieces to make this dress. To make the shape a bit more dramatic I made the back piece quite long and a bit wider to give the dress more movement and volume when it moves on the catwalk. This dress also took quite some time to make because I was using the technique of melting plastic onto fabric. During my research and experimenting stage I decided to look at feathers, rather than just using feathers I looked at how I could create my own. I was then shown the process of melting plastic onto fabric using a heat press, this technique was something new and something that looked lovely. This meant I had to cut out a load of feather shapes out of plastic to then heat press them on my fabric. It was a fiddly process but it looks really nice on the chiffon. However I soon realized the more I moved and fabric to sew it up the plastic feathers were peeling off. There was nothing more I could do but keep ironing them down which was a little frustrating. If I were to remake this dress I would have to use another method of printing so the feather shapes stayed on the chiffon. Despite the issue of the plastic not working too well on the chiffon It did look lovely, especially when the model walked down in it. Because the dress was see through I made a simple bodycon dress to go underneath it. 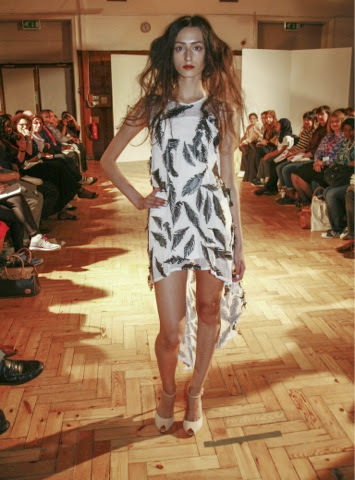 The third dress I made was inspired by the native american headdress, taking the element of the band and feathers. I used the same princess bodice pattern to make my third dress but taking out some seam allowance because the first time the dress was a bit big. The embellishment for this dress was just in the band and feathers that were going to go on the skirt. The waist band included beading, applique and embroidery which ended up looking beautiful. To make the band look neat I made my own bias tape and sewed it along the edge of the top and bottom. I am very please with how the waist band turned out with the different shapes and colours complimenting each component. The next part of embellishment for this dress was the feathers that were going to go down the skirt however upon placing them on top of the dress I realized it made the dress look cheap and tacky. I really wanted to incorporate the feathers on the dress because it was inspired by the native american headdress so I played around with the positioning of them. In the end I positioned the feathers on the top and at the bottom edge of the waistband. This made the waistband look even more nicer and gave the dress a drawing point for the eyes to look at. The black and red colour scheme of this dress just looked very beautiful and classy. I think the outcome of this dress was alot better than the original design. All the elements of this dress worked well together, just like the other two dresses I made. There are a couple of changed I would make to the one dress if I were to redo it but apart from that I am pleased with the garments I have produced withing a couple of weeks. 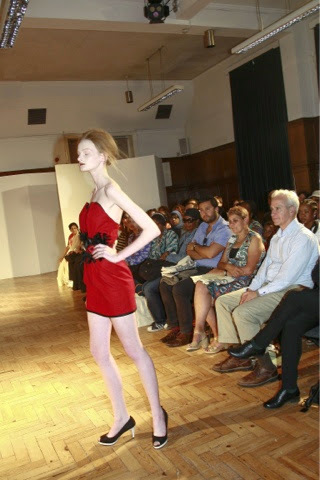 After lots if time, handwork and determination we finally got to the day of our fashion show. Obviously it wasn't a stroll in the park but it did end very well with all the garments walking down the catwalk. The day began with trying/ fitting the garments on the models and needing to do any alterations that needed to be done. With 14 students, 5 agency models and lots of clothes you can imagine just how crazy it got at times. Luckily some students had their friends come in to model their garments but for the rest of us it was a crazy day. We got in a make up artist,a nail technician and Toni and Guy to help us out in making sure everything was just amazing. I was worried about my dresses not fitting on the models but luckily I only had to take in only one dress to fit the model right and add a bit of body tape to secure it. We had a run through at around 1'O clock which really tested how fast we could work. There were some people watching the show at that time so we had to do it just as if it was the proper show. Because it was the first time we were doing anything like this it was very chaotic. When a model went out and came back we all had to work quick to get her out and into the next garment and again with the next model that came in. There was no time to take a quick breath because of the fact we had five pro models and lots of garments for them to wear. Luckily with the students friends and videos shown we were able to get the out on time back and changed to send them out again. By the end we got the hang of it and knew just what we were doing. When that finished we went though what we were and weren't going to do for the final show. The run though show really helped us to see how we would work, without it I don't think we would have done as well. It was a long, hot and very tiring day with models still needing to be done up for the final show. Despite all that I was confident that the show was going to be a hit. After a long day, counting down the hours all the garments went out looking fabulous. Although I don't fancy doing another show for a while it was a great day and im proud of the work that we sent out on the day. Hopefully I'm going to get the photos taken by the photographer but for now here are my dresses that I made. Its gone from counting down weeks to counting down days and as expected the stress levels went up. I did worry for a bit that I would not have 3 completed dresses walking down that catwalk but luckily I did finish them all, the rest it down to how well tomorrow goes. These last couple of days was about finishing everything off making sure they were as good as they could be. 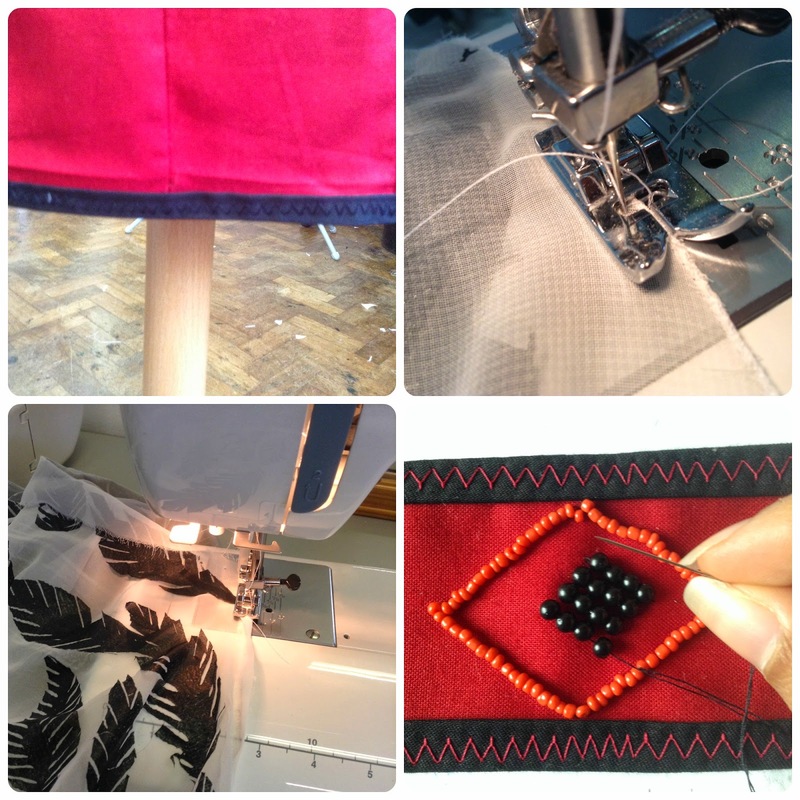 This involved sewing up and adding hems to my chiffon dress and hemming up my red dress. I had to make a change to my red dress because it didn't look as nice as I wanted to but I think the change makes it look even better. I'm happy with what I have produced in just a few weeks. That's all for now, we'll just have to hope the fashion show tomorrow goes by smoothly. Surprisingly with 1 week to go I am fairly calm, everything is going well steadily. At this point I have 1 completed dress, 1 base of the dress done and half a dress I need sewing up. There was a lot of sewing up dresses and adding finishing touches to my first completed dress. This week also involved me cutting out a number of plastic feathers for me to heat press onto my chiffon pattern piece. Its a very time consuming process but the look of it is lovely. Hopefully I will get everything I need to by the end of the school week for the fashion show on Friday. As you can tell from the snippet of photos I have been very busy cutting, sewing and embellishing. I am looking foward to looking back at the three finished garments and seeing how they work together. So it's 2 weeks until our fashion show so the stress levels are high. At this point I'm semi confident that I'll finish on time. 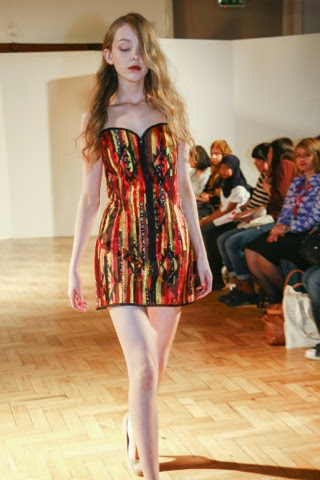 At this point I have nearly finished dress one which was inspired by a Native American textiles sample I did. I used a basic dress pattern and from that designed a sweetheart bodice type pattern. I then ironed on bona web onto the pieces so I can then stick the strips of fabric onto the pattern pieces. This dress is decorated with appliqué and printing. The printing involved me cutting out my own stencils from freezer paper and painting using a paint brush and fabric paint. Luckily the paint dried quite fast so I could iron it so secure it and move onto my next process. 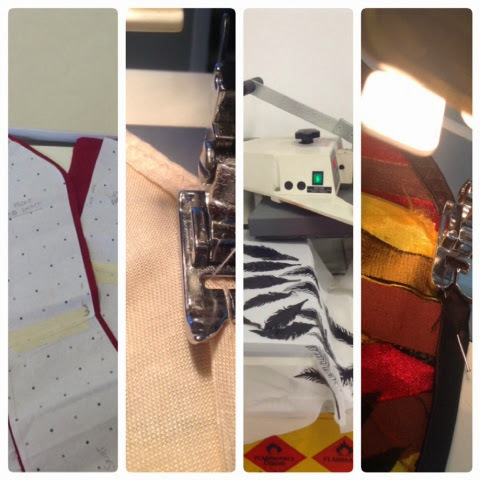 The appliqué technique involved me cutting strips of a range of fabrics and sticking them on my dress pieces using bondaweb. This process was very time consuming but I think the end results looks quite nice, especially with the frayed edges making it have a rustic look. The pictures are a sneak peek into what I'm going to finish with. Today we had the privilege of being shown how to design prints in Photoshop by a graphic illustrator/designer. Luckily I knew my way around Photoshop so It wasn't too difficult for me to understand but there were some new buttons that I was learning about. 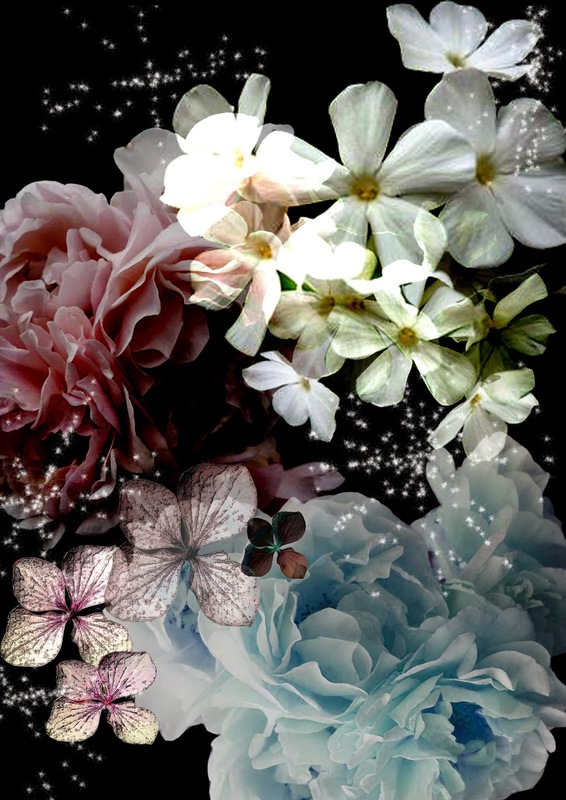 I learnt more about creating beautiful layered images to create one new image. This lesson fit in perfectly with my floral project I was in between doing, It was something extra to add to it. 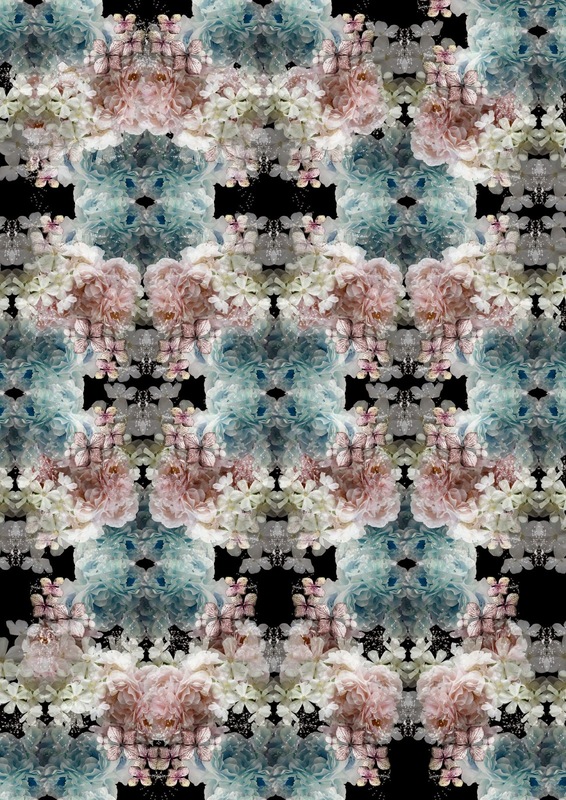 It was so much fun to play around in Photoshop and create a beautiful pattern that could be printed onto a garment. Im a fashion foundation student hoping to get into the fashion industry by designing.This blog is a collection of my work I do in college. I like designing red carpet/catwalk dresses filled with decoration. As well as designing I enjoy dress making, drawing and jewellery making.